Version 2: I made some changes to these rules. The original version can be found here. The rules were simplified and are now very similar to the rules I use for other battles. I changed the sequence of play to try and make the game faster. It still runs too long, and I have difficulty setting up and finishing the game in two hours. Historical Background: The Confederate attack on Devil's Den and Little Round Top was the subject of considerable controversy. It began late in the day and was marked by confusion and a general lack of coordination. The terrain was partly responsible for this. Law's Brigade, with belated support from Robertson's Brigade, fought Ward's Brigade in and around Devil's Den. The fighting was fierce. The Confederates eventually drove the Union away but the timely arrival of the 40th NY prevented them from exploiting their success. Benning's Brigade maneuvered to attack Little Round Top from the flank. By the time they arrived Vincent and Weed had arrived to defend the crucial position. Oates' 15th Alabama was given the difficult task of assaulting up the hill. They ran into Chamberlain's 20th Maine, which was defending the far left flank of the Union army. Several charges were turned back. Finally, with his men low on ammunition, Chamberlain ordered a bayonet charge, which finished off the weary confederates. The confederate's failure to take Little Round Top set in motion the famous events of the next day. Lee ordered a frontal assault on the Union center. Pickett's charge would go down in history as a bloodbath of legendary proportions. The Union stopped the attack, inflicting horrendous casualties on the confederates. Battle 2: This time the confederates sent Robertson's brigade against Devil's Den and captured the position with surprising ease. However the rest of the Union line held firm. The confederates advanced rapidly through Devil's Den trying to exploit the Union's open left flank as the Union desperate moved reinforcements onto Little Round Top. The remains of Robertson's brigade, joined by Benning's brigade, splashed across Plum Run for the final assault on Little Round Top. 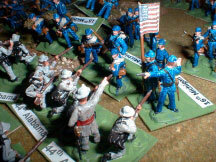 The Union rapidly assembled their reinforcements for a final stand at the summit. The confederates attacked with a fury. Joshua Chamberlain and the 20th Maine blocked their path, but Chamberlain was mortally wounded in hand to hand fighting, and the Southerners advance to the top of the hill. The confederates looked like they were on their way to victory, routing every Union regiment in their path. With time running out we went to "fast forward sudden death overtime" rules to settle the matter. In the nick of time the Union pulled out a victory thanks to the desperate defense of the 6th New Jersey and 40th New York. This battle was a narrow Union victory. Victory Conditions: The side that controls Little Round Top at the end of the game is the winner. The Map: The battlefield was 7.5' x 5'. I started by making the map entirely out of felt. Green was used for the main tablecloth, blue for the stream, gray for Devil's Den, and tan/brown/black for the hills. All of this was glued onto the main cloth using spray on adhesive. 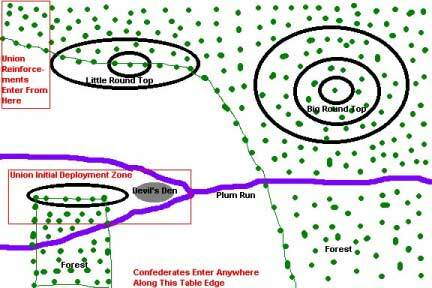 I outlined the boundaries of the forest with a black magic marker. This was sufficient to run the game, but I also had some hills of the correct size and shape, which I added for effect. When it was time for the game I simple unrolled the map, spread some rocks in Devil's Den and used model railroad trees to line the forest boundaries. Building the Armies: I mounted three figures per base (commanders mounted individually), but I suggest using just two figures to a base so you don't need as many figures. Five boxes of Imex Union and Confederate Infantry and one box of Imex Union and Confederate Artillery provided all the figures I needed. If you go with two figures per base you'll need three boxes of infantry. The uniforms for the sharpshooters were painted green. The bases were painted green to match the felt on the gaming table. Each base was then given a ID label using computer generated mailing labels. The labels were color coded by regiment using colored pencils. Each regiment includes a figure carrying a flag. My flags came from Warflag (www.warflag.com). The flagstaffs were made from paperclips. Here are some paper soldiers you can print and use: gettyfigs.PDF. Sharpshooters: The two Sharpshooter units may be deployed as units or they may be broken up. 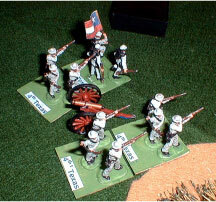 If they are broken up one or two sharpshooter bases may be added to any Union unit that is deployed at the start of the game. If they are broken up they must stay with their adopted unit for the remainder of the game. They are treated as a part of their adopted unit for all purpose, but continue to shoot as sharpshooters. Movement: Infantry can move 6" if they are in line formation or 12" if they are in column formation. Commanders may move 12". Artillery can move 12" but it may not fire on a turn when it was moved. Artillery can pivot in place during movement and still fire. Units may about face (turn 180 degrees) once per turn. 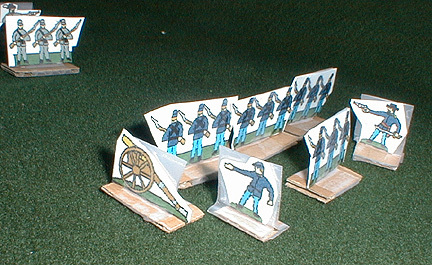 Units may move backward while still facing to the front at half speed. Units lose half their movement when moving on Big Round Top or Little Round Top, they also lose half their movement if they cross the stream (pay this penalty only once, the first time they get to the stream). Units may not move within 1" of an enemy unit except when charging. Fire: Units that are in line formation and artillery that didn't move this turn may fire. Range is measured from the center of a unit to the nearest part of the target unit. 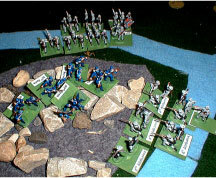 Units may only fire to the front and may not fire through narrow gaps between friendly units, or over the heads of friendly units. Roll one die per base or two dice per gun model. The chart indicates the number needed for a hit. Remove one base for each hit rolled by the firing unit. It takes three hits in the same turn to remove an artillery base. Note that you only use the 1" firing column when shooting at a charging unit. If a unit is reduced to a single surviving base then the last base is immediately removed. Protective Cover: Targets in cover get saving throws. Roll one die for each hit. Ignore the hit if the roll is a 6 in woods, or a 5 or 6 in Devil's Den. Morale Checks: If a unit has to take a morale check Roll one die. If the roll is less than or equal to the number of bases (plus a commander if one is present), then it has passed. If the role is greater then it fails. Artillery must roll a 4 or less to pass a morale check. Melee: Each side rolls one die and adds in any bonuses. High roll wins. The loser removes one base and retreats 12". If it's a tie each side loses a base and rolls again. Commanders: Each Brigade Commander (and Joshua Chamberlain) is represented on the table. A Brigade Commander may join or leave one of his units during movement. This unit gets a +1 bonus on all melee rolls and the officer counts as a base when testing morale. Every time a unit with an attached commander is completely eliminated by enemy fire (last base removed), or is engaged in a melee (win or lose) roll one die. If the roll is a 6 the commander is a casualty and is removed from play. This is the only way a commander can be eliminated.